3 types of sleeping positions and how they are linked to better health. Most adults get between 7-9 hours of sleep per night, but sleeping too little or too much can have negative health consequences both in the short and long term. A 2011 European Heart Journal review of 15 medical studies involving almost 475,000 people found that short sleepers had a 48% increased risk of developing or dying from coronary heart disease (CHD) in a seven to 25-year follow-up period (depending on the study). They also found a 15% greater risk of developing or dying from a stroke during this time. Interestingly, long sleepers — those who averaged nine or more hours a night — also showed a 38% increased risk of developing or dying from CHD and a 65% increased risk of stroke. But how can changing your sleeping position help prevent stroke and heart disease? Sleeping positions can play a role in snoring, neck pain, heartburn and even facial wrinkles! (2) Some positions are better than others for neuro-musculoskeletal well-being. Put simply: the way your head rests on your pillow could be the difference between a restful sleep or a night of tossing, turning, discomfort and accelerated aging. And how long you sleep really does impact your health. How can too much or too little sleep lead to chronic health conditions? Decreased heart rate variability (HRV). As a rule of thumb, increased HRV = good, decreased HRV = less good. There are several apps out there that can help you track your heart rate variability including my favorite: HRV4 Training. Increased C-reactive protein. The protein is released under times of stress and inflammation. Therefore, sustained elevations of this marker mean an increased risk for cardiovascular and heart disease. Hs-CRP can be evaluated using a simple blood test and is part of our wellness panel at VIOR. Elevated blood pressure. Sleeping, especially restful sleep, allows the heart to take a break from having to pump harder against gravity while awake. Not sleeping enough, or sleeping poorly doesn’t allow the heart to rest as it should which means it doesn’t get a vacation from increased beats per minute or decreased resistance within the arterial wall. Appetite regulation. A 2004 study of 1,024 volunteers evaluated sleep duration and serum leptin and ghrelin markers. These are two major opposing hormones in appetite regulation. Participants with short sleep had reduced leptin and elevated ghrelin. These differences in leptin and ghrelin are likely to increase appetite, possibly explaining the increased BMI observed with short sleep duration. Insulin Resistance. Science Daily reported in 2015 that one night of total sleep deprivation may be as detrimental to insulin sensitivity as six months on a high-fat diet. 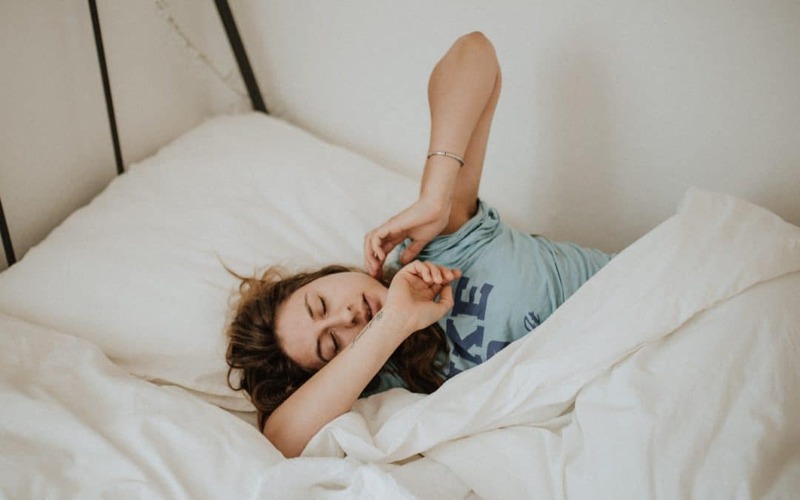 This research demonstrates the importance of adequate sleep in maintaining blood sugar levels and reducing risk for metabolic diseases like obesity and diabetes. With a proper mattress and pillow, back sleeping is a very popular sleeping posture since you are not forcing any part of your body to be positioned unnaturally. The head, neck and back are kept in a natural position most easily and the face does not make any contact with your pillow to prevent bunching of the skin. Unfortunately, sleeping on your back increases the likelihood of snoring and is not recommended for persons with sleep apnea. It’s extremely important to select a pillow the support the neck in its natural lordotic curvature. Using too many pillows and having the neck in a flexed position can negate the benefits of this position. This posture is the most recommended position by physicians for reducing strain on the low back in normal adults, and especially for expecting mothers. It also has the added benefit of elongating the spine and reducing snoring as it opens up the oropharynx. For those of us sharing the bed with a partner, snoring can often be remedied by pushing them onto their side from their back. Unfortunately, although this position may benefit the spine, given that the head and spine are in proper relationship as per the graphic below, it does not fare well in premature aging of the face skin. Sleeping on the side may bunch up the face and contribute to premature wrinkling. This is by far the worst posture to sleep in. This can also be the most difficult sleep position to change! I recommend that people who have difficulty kicking this habit use a second pillow to wedge between their knees and a third to prevent them from rolling over from a side to stomach position. Full body length pillows may also be used. Sleeping on the stomach forces the head and neck into rotation for extended periods of time and doesn’t support the natural curvature of the spine. Numbness, tingling, neck pain and back pain can result from a history of stomach sleeping. While undergoing care in our office, if you are a stomach sleeper then the long-term effectiveness of the treatment reduces dramatically. For those of you that do better with graphics, have a look a this fantastic infographic from the Wall Street Journal regarding sleep positions. Poljsak B1, Godic A, Lampe T, Dahmane R. The influence of the sleeping on the formation of facial wrinkles. J Cosmet Laser Ther.2012 Jun;14(3):133-8. doi: 10.3109/14764172.2012.685563.